Monday was a pet day in an otherwise generally miserable February. We had blue skies and bright sunshine, a crisp spring day, and we were quickly into the car and off up the M9 to visit snowdrop gardens. Burtown House, near Ballintore, Co. Kildare, is furthest away from us and was our first stop while, later in the day, we visited Altamont Gardens (described in a previous journal) before going on to Shankill Castle in Paulstown, Co. Carlow. Burtown House dates to 1710 when it was built for the Quaker, Robert Power. The layout of the garden is credited to Isabel Shackleton who married the present owner’s great grandfather but in the last twenty years it has been Lesley Fennell and her son, James, who have made the garden their own. 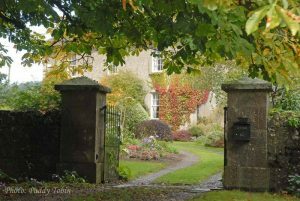 The original gardener, Mother Nature and the passing of many years must be credited with what is the iconic picture in the garden at Burtown House, the mass planting of winter aconite under a group of trees to the side of the house. In season, it is one of the most spectacular planting of this sort in the country and it is one of the thrills of the gardening season to see this. The drive to the house has an informal arrangement of old trees – one horse chestnut is an outstanding specimen with branches sweeping low almost to the ground – and these were underplanted at some time with snowdrops, rather unusually with more Galanthus plicatus than the common snowdrop, Galanthus nivalis. These have spread moderately over the years and would have been better enjoyed if the grass had been cut late last autumn and the debris from the trees cleared away. There are further naturalised snowdrops in a small woodland area which is beyond the house and gardens and, here, is it the common snowdrop, Galanthus nivalis, which dominates, mainly in its single form though with occasional clumps of the double-flowered form, Galanthus nivalis flore pleno. Nearer the house some new snowdrops have been introduced to provide further interest and diversity but these have not yet built up in sufficient numbers to make an impact. I expect the selection of snowdrops will be increased over coming years so as to attract further visitors. The woodland at Burtown House with Galanthus nivalis spread about under the trees. Shankill Castle is in the village of Paulstown which was for us, before the M9 was developed, no more than a junction on the road to Dublin. Looking over the wall from the car, one could see two parallel raised landforms leading the eye to the front of the castle and I had always imagined it might have contained a formal stretch of water, a canal of sorts, at one time but it appears that this was not the case. An original Butler tower house was rebuilt in 1708 and set in a formal garden landscape with a vista to the front and a canal to the rear. Though the general layout of the gardens is still discernible all is now rather rough and unkempt and the majestic giant Sequoias, a Victorian favourite, must now compete with seedling ash. Without a guide, I could not discern the 18th century lime allees, the 19th century laurel lawn nor the later rose garden except that the latter is not described as “The Moat Garden” and shown on the provided map. We didn’t manage to gain access to the walled gardens but, from looking through the gate, they were empty but for a goat and some ancient fruit trees. There was a further walled garden which we didn’t manage to view and, which I imagine is put to more use because I see that fruit is sold in season. 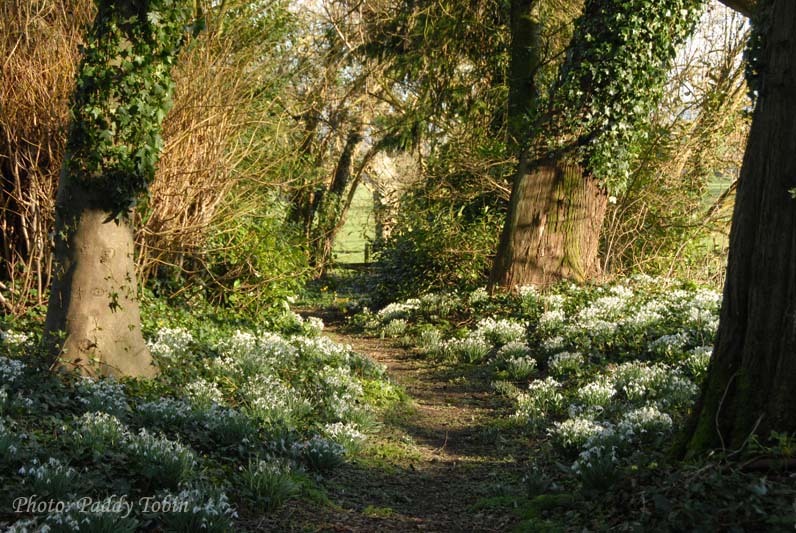 However, there were snowdrops – thousands and thousands of snowdrops – running through the woodland, along a drive to one of the entrances, scattered here and there under mature trees and, most impressively, in an ancient graveyard which predated the earliest house on the site. The lady who greeted us on our arrival informed us that the first snowdrops were planted only twenty five years ago. Given their numbers this was both surprising and impressive though the style of the planting did indicate the hand of man rather than the whim of nature as almost all were in clumps rather than in more disorganised drifts. Nonetheless, there was a wonderful atmosphere here and especially so in the graveyard where moss covered headstones and bright snowdrops made a fascinating combination. Snowdrops on one of the Castle drives. Great blog Paddy. A few points on Shankill – I know it well. The original entrance lay to the front of the house and framed towards Mount Leinster. The original gates are still there on the main road just up from the side entrance you came in from. The forms that you thought were a canal are actually the banks to the side of the original driveway. It is my understanding that the canal to the rear of the house is by a garden designer who had a connection to Powerscourt gardens. The snowdrops have been there for much longer than 25 years – my wife knows the previous owners who had them in their family. Certainly the large amount of them would indicate much longer than 25 years. To the front of the house were some nice extra large plicatus – quite distinct – don’t know if you saw these. Great to see the garden in print. Hi Des,Many thanks for that. I didn’t see any G.plicatus but could easily have missed them. The common snowdrop is in large numbers and have the signs of having been lifted,divided and replanted at some stage. Yes, they are lifted and divided every year, a great show of them especially in the graveyard.